Steal a statuette for a mystery buyer. Promotion to Bandit, 100 gold, access to new fence in Leyawiin, Dar Jee. Receive the next mission from Armand Christophe. Travel to the chapel in Cheydinhal, and gain access to the undercroft. Avoiding all guards, enter Lady Llathasa Indarys' crypt to steal the statuette. Steal the statuette, and return to the Imperial City, only to find yourself in a new predicament. Neutralize any suspicion of Armand Christophe by exposing a snitch in the guild. Plant the statuette in Myvryna Arano's cupboard then alert Hieronymus Lex. Persuade him to search Myvryna's home, and she will be arrested. Once that is done, Armand Christophe will promote you to the rank of "Bandit", and inform you of another doyen to take missions from. Your next job consists of stealing a statuette made in memory of the recently deceased Lady Llathasa Indarys of Cheydinhal. It is only possible to start this quest after you have fenced 100 gold. Once you arrive in Cheydinhal, asking the beggars reveals that the statuette is located beside Lady Llathasa's crypt in the chapel undercroft of the city temple. The place used to be free to public access, but has recently been placed under guard by command of the town's count, Count Indarys. The undercroft is guarded 24 hours a day by the Chapel Guard, an Altmer watchwoman who circles through the undercroft on her patrol route. If spotted, she will attack you on sight even if you have committed no crime other than trespassing. Killing her will count as a murder, as well as invoking the blood price for the quest (usually 1000 gold). Therefore, the challenge in obtaining the statuette is sneaking past the guard. A decent sneak skill, perhaps coupled with an Invisibility or Chameleon enchantment, and good timing are key to success. Lady Llathasa's crypt is to the left, down the stairs. In the back of the alcove you will find the statuette (Llathasa's Bust) and a coffin (Llathasa's Tomb). As long as you only pick up the statuette you can sneak back out of the undercroft without incident, and return to the Imperial City. If, however, you also try to plunder Llathasa's Tomb (i.e., if you activate the coffin to see what's inside), you will conjure up her ghost. 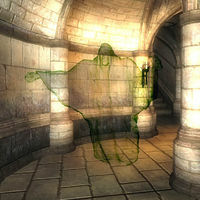 The ghost will attack you, which will usually alert the guard as well. The easiest way to avoid this is to simply not look inside the coffin; the one or two pieces of unenchanted jewelry in the coffin aren't really worth the trouble. Allow the guard to see you. Grab the statuette then run out of the chapel with the guard in pursuit. Run to the nearest town guard, who will act in your defense and kill her. Doing it this way will not incur a bounty since you only provoked her, and she was the only one who detected you, thus when she dies, so does your incrimination. Use calming magic such as Soothing Touch on the guard before she attacks, then run out. You will not incur any bounty from this and the guard will not follow you. You can allow Llathasa's Spirit to see you, and position yourself so that the ghost will attack the guard. The ghost can usually kill the guard and it won't incur a blood price. Since this was done in the undercroft without anybody else watching, you won't incur a bounty for trespassing. You can then just run outside followed by Llathasa's Spirit, and the townspeople will all gather around and attack her (although this risks killing numerous townspeople, especially since most of them cannot do any damage to the ghost). Unfortunately, upon arrival in the Waterfront, you find out that Armand has been accused of stealing the statuette and has gone into hiding. Even worse, the Waterfront is crawling with guards including Hieronymus Lex. Talk to Isleif or Hillod in the Waterfront district and ask where Armand is. They will tell you that Methredhel is looking for you. If you don't run into her in the streets or while you're inside a building, visit Methredhel's house to find out more about Armand. Methredhel explains that your job was a setup in order to expose a traitor in the Thieves' Guild. The traitor is a Dunmer named Myvryna Arano (the same woman who delivers the invitation to the Thieves' Guild). In order to turn the tables on her, you must sneak into her house (located on the Waterfront). If your sneak skill is good enough, you may be able to get into the house with guards around (just make sure the sneak "eye" shows that you are undetected); if your sneak skill isn't good enough, you will have to wait a long time before there are no guards around. Once inside, place the statuette in "Myvryna's Cupboard", which is the cupboard nearest the door and next to her bed. Then speak with Hieronymus Lex, who at this point should be running around the huts on the Imperial Waterfront, and convince him to search Myvryna's house. Lex's disposition must be at least 71 for him to believe you. Once this is done, Armand will be cleared of charges and will meet you at midnight in the Garden of Dareloth. He will then promote you to the rank of Bandit, as well as giving you the name of another fence, Dar Jee, in Leyawiin, far to the south. This is the last quest you will receive from Armand Christophe. If you ask him for more special Thieves Guild quests, he will tell you to see S'Krivva in Bravil. When you go to meet Armand Christophe to obtain this quest, you'll notice that Myrvyna Arano is spying on your conversation with Armand by hiding behind a bush behind her house. Use a Detect Life spell to see her outline. If you talk to her, she will show anger, but say nothing relevant. If you are lucky, you can witness a rather funny scene, where one of the roaming guards will bump into Lex and ask him if he "has seen/knows the hideout of" Armand Christophe, to which Lex will answer with the standard beggar answer "i don't know. please, don't hurt me". This can happen if a guard bumps into another too. After you complete the quest, the Chapel Guard guard remains on patrol in the Chapel Undercroft, and respawns if killed. She still attacks you on sight, though blood price no longer applies. If you kill her, you can take her nearly-complete set of chainmail armor. Beware that killing her still counts as a murder, even though she attacks first. If, however, she dies without alerting any other NPCs (which is usually the case, as she's normally the only NPC around), you will not receive a bounty but still be noted for the murder. This is also useful if you would like to get your thief character into the Dark Brotherhood. The chapel guard and Llathasa's Spirit will not attack you if you are a Pilgrim in the Nine Divines, having started the Knights of the Nine quests. Taking the items won't count as stealing either, making the quest very easy. If you are caught by the guards or Lex and choose to pay your bounty or go to jail, the bust will not be removed from your inventory even though it is marked as stolen, because it is a quest item. The two beggars in Cheydinhal, Luckless Lucina and Bruccius the Orphan, will give you a bit of background on Count Indarys and his former bride: "It's been twenty years or more since the Count married Llathasa. She was a beautiful Elven bride. She remained young while he aged. Not too long ago she was found slain. It's all hush-hush. Nobody knows exactly what happened. ", and "Count Indarys recently commissioned a bust of Llathasa. They say the Elves carved it. He put it near her tomb in the Chapel Undercroft. He also posted a guard so that her tomb wouldn't be disturbed. Used to be anyone could visit her, but now it's off limits to the public. There's a rumor going around that the Undercroft may be haunted." After the quest, it is possible to visit Myrvyna Arano in the Imperial City jail by asking to visit a prisoner. Llathasa's spirit is not hostile towards the Chapel Guard. An achievement will be unlocked upon being promoted to Bandit. Do not start the An Unexpected Voyage quest while this quest is active, doing so will crash the game. See this page for details. If you enter Myvryna's house with Lex while she is not there, he will check the cupboard, and then he will immediately leave the house to go confront Myvryna, leaving you stuck in View mode. After Lex finds Myvryna, he will confront her and you will receive a quest update. Use the code movetoqt to follow Lex so you can actually watch the speech. Alternatively, use the command enableplayercontrols to get out of view mode so you can follow Lex. After Myvryna has been arrested, Armand sometimes does not subsequently appear in the Garden of Dareloth at midnight. He may be in the Imperial Trading Company Warehouse basement where he hides during this quest. The warehouse is the easternmost one along the waterfront (the right-hand 4 on the map). You can go find Armand in the warehouse. You can also pickpocket a beggar near the waterfront so you are cast out of the Thieves Guild. Make it your active quest, and Armand may reappear. You can use the console code player.moveto 352A0 to move to wherever Armand is located. If the Waterfront guards are dead, their bodies will still go to the house area. This quest can be completed without actually having to steal the statuette. If you kill one of the Blood Price NPCs while the quest is active, paying the 1000 gold Blood Price automatically completes the quest. Sometimes the quest markers keep pointing to Myvryna's house after you have dropped off the statue. This makes it hard to find Hieronymus Lex. See his page for his schedule. ? Once you have advanced the quest to stage 15, returning to the Waterfront may trigger the stage 30 popup whether you have the bust or not, but Lex and the guards will not actually be there if you have not yet stolen it. Do not plant the bust in the cupboard and then immediately take it back. Because it's a quest item, you will not be able to place the bust in the cupboard again, and you will not be able to tell Hieronymus Lex that the bust is in the cupboard. ? This can be fixed by reloading an earlier save. 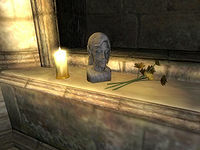 Killing the Chapel Guard (starting Blood Price), AND stealing the bust -- After you plant the evidence in Myvryna's cabinet and then tell Hieronymus Lex where it is, Lex will proceed as planned to enter Myvryna's house, but when you go inside he won't actually be there. The quest marker will be placed in an inaccessible location, and he will have disappeared from the entire game. If this should happen to you then click "wait" for 24 hours, and he will reappear inside Myvryna's house as if nothing had happened. If waiting doesn't fix the problem then you must reload a save. ? 10 Armand of the Thieves Guild has asked me to steal the bust of Llathasa Indarys from Cheyhindal. They will pay 100 gold coins. 15 I learned that the bust of Llathasa Indarys is in her tomb. She is buried in the chapel undercroft of the Temple of Arkay in Cheydinhal. 20 I have the bust. Now to get back to Armand. 30 The Waterfront is crawling with Imperial Watch. They are all looking for Armand Christophe. I'm sure he won't show at midnight. Dareloth's Garden is too hot. I'll need to find out where he is hiding. Maybe one of the other Thieves Guild members knows. I'll have to start asking around for them. 40 I overheard the pompous Hieronymous Lex say that there is an informant in the Thieves Guild. 50 Methredhel contacted me. She says that this whole job was just a setup to flush out the informant, a Dark Elf named Myvryna Arano. They didn't see fit to let me in on the plan though. She has specific instructions from Armand to plant the bust in Myvryna's cupboard. Then I have to find Hieronymus Lex and snitch on her. 60 The bust is in Myvryna's cupboard. Now to tell that windbag Lex where to find it. 70 I told Hieronymus Lex that Myvryna was the thief. He didn't believe me, probably because she is his informant. Fortunately his overblown sense of duty will make him check it out anyway. He is insisting I follow him. 75 Hieronymus Lex found the bust I planted. Now all I have to do is report to Armand. Unfortunately I'll have to wait until the next midnight for him to return to the Garden of Dareloth. 80 Finishes quest Armand thanked me for my help in exposing Myvryna Arano as the informant. He promoted me to Bandit in the Thieves Guild. 30 I have slain one of the residents of the Chapel of Arkay in Cheydinhal. I'll have to pay the blood price for it. Armand told me it is 1000 gold per person slain. Unfortunately, he will only talk to me after midnight in the Garden of Dareloth. 31 Armand is extremely unhappy. I have to pay a blood price of 1000 gold coins for each resident of Cheydinhal's Chapel that I killed. Until I do, I am out of the Thieves Guild. Unfortunately, he will only talk to me after midnight in the Garden of Dareloth. 35 Finishes quest I paid my blood price. Armand has readmitted me into the Thieves Guild. It is possible to use the console to advance through the quest by entering setstage TG03Elven stage, where stage is the number of the stage you wish to complete. It is not possible to un-complete (i.e. go back) quest stages. See SetStage for more information. Esta página foi modificada pela última vez à(s) 03h09min de 26 de janeiro de 2016.